Analog Artist Digital World: Family Days at the Mennello Museum of American Art. 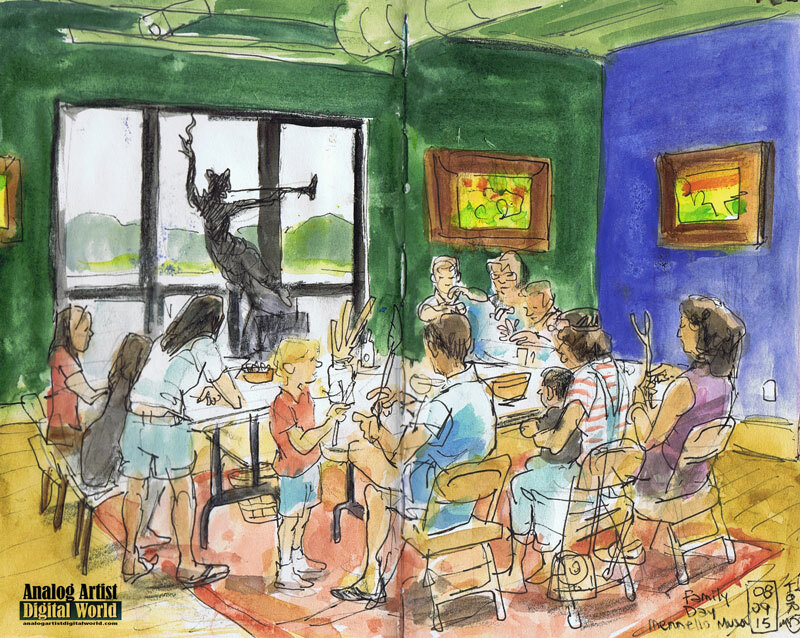 Family Days at the Mennello Museum of American Art. On the Second Sunday of each month there is a Free Family Day at the Mennello Museum of American Art, (900 E Princeton St, Orlando, FL 32803). The make-and-take craft table is open from noon-2:30 p.m., and docents are available to give mini-tours of the museum. Then it's open house in the galleries until 4:30 p.m. The craft table is always bustling with parents and children. On this day, kids could convert an ordinary stick into an exotic talisman. Yarn could be wrapped around the stick and there was plenty of paint and beads to add to the decorations. The Earl Cunningham paintings literally glow with the way they are lit in this gallery. The next free family fun day will be Sunday, October 9th, 12 - 2:30 p.m. Guests can engage with the newest temporary exhibition, Three American Artists on one of the 15 minute Tenacious Tours happening every half hour. Be inspired to create your own work of art investigating energy and wind like Alice Aycock, landscape and material like Barbara Sorensen, and figure and metaphor like Deborah Butterfield. The galleries will remain open until 4:00pm!